Rich Black Damascus–it's here and in stock, ready to ship! 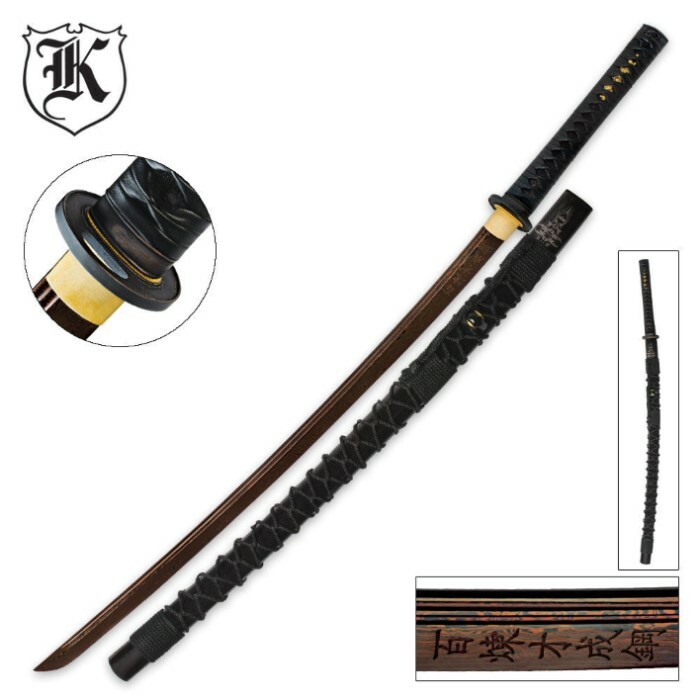 The Dragon Stalker Katana is a Samurai masterpiece, evoking a since of nostalgia from ancient feudal Japan with a Rich Black Damascus steel blade. 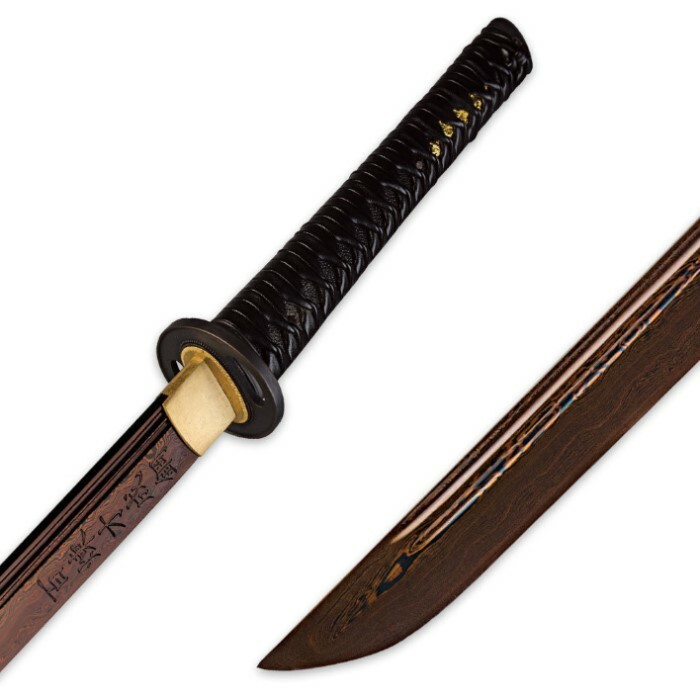 Crafted in the same style as the katanas of that time period, this Dragon Stalker katana features a sharp, heat-forged Damascus steel blade with dual blood grooves. 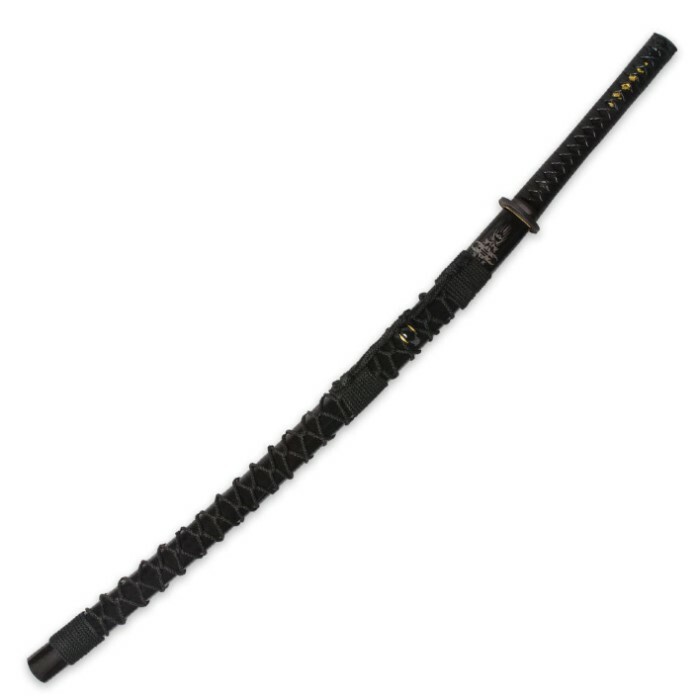 Included with this katana sword is a high-polish, lacquered hardwood scabbard to house the 29-3/4" Rich Black Damascus blade in authentic Samurai style. Measures 41" overall. This is my new favorite sword. I've been collecting swords for 9 years now. I've put some through extreme tests and broke my fair share. I also have some collectable swords that are just for display, but, this is an amazing balance between beauty and quality. Beautiful sword, solid, fits snuggly in the saya wonderfully balenced. It's thinner and lighter than some other damascus blades, but handles better. Beautiful piece. This is a great sword in my admittedly novice opinion. It feels solid in your hands and is very tight with no rattle our loose anything anywhere. The blade is beautiful. The red Damascus is really a sight to behold and is razor sharp. While the paracord wrap on the scabbard is decorative, if you were in a pinch in the wilderness during the apocalypse it would come in handy. The blade also fits tightly in the scabbard and takes a bit of effort to draw but I imagine it would pull just fine after a short break-in period. I have been looking for one particular sword I could keep as my own, since I'm not really a collector of these. I wanted pretty and functional, and I think I found it here. I like the Shinwa swords, but they are somewhat cookie-cutter items. Here, there is a gorgeous Damascus blade and detailing for beauty. The steel is more than fine for what this is, which is a weapon. It isn't an axe or a machete, so don't go chopping wood with this, or you just tossed away some serious change. Swords are for cutting live meat, to be fair and honest, and this should surely do the job. But in honesty and practicality, this is for display and showing off. It will also do for that. Sure, there may be better swords, and there may be comparable for less, but this is so attractive and it shows someone took the care and time to do this right. If you really want some better sword for chopping up the hoods of cars, keep looking. But if you want a dazzling sword for a great price, this one comes recommended by me. I am not a sword aficionado, but I have been collecting and using quality blades and knives all my life. I know good and I know great when I see it. I will never regret buying this sword. This sword is absolutely breath taking.. Orange Damascus blade is just awesome looking.. All my friends drool over it.. Mine was RAZOR SHARP!!.. Leather wrapped grip is totally awesome and feels really great in you're hand.. My only complaint is that BUDK doesn't tell us what kind of steel it is.. and if it's full tang.. Fells really solid and is definitely a forged tang at the least...GREAT SWORD!!.. Highly recommend!! BUDK IS THE BEST!!!! So why if I may ask is the sheath wrapped in rope, is so that it can be used to scale a wall like assassins and spy's of ancient times did by leaning the sword against the wall and using the hand guard as a step up to make it up and then use the cord to pull the sheathed sword up afterwords? Cause I remember seeing that in an old book when I was little.